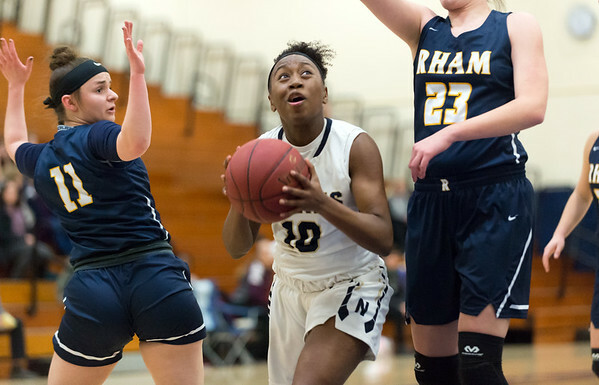 NEWINGTON - With defending Class L champion RHAM coming to town, Newington girls basketball saw an opportunity to make a statement, one which would further validate its 12-1 record under first-year head coach Marc Tancredi. Newington suffocated RHAM’s offense, forcing 10 turnovers in the first half alone to cruise to a 55-46 victory, the team’s seventh in a row. The win also snapped RHAM’s four-game winning streak. The usual suspect, Frazie,r led the offense with 18 points (with the majority coming off turnovers), but Karissa Zocco provided the flashiest offensive performance of the night, drilling four 3-pointers en route to 17 points. Newington’s defensive surge began after a 3-pointer from Zocco, her second triple of the quarter to put the Indians ahead 8-6. The Indians’ full court press forced a turnover on the ensuing inbounds pass, leading to an easy layup for Alexie Armour, helping Newington turn a one-point deficit into a four-point lead in a matter of seconds. Newington’s active defense forced five more turnovers during a 13-2 run that stretched into the second quarter, but RHAM finally began to find some cracks in the Indians defense, scoring seven-straight points to cut the lead to three. Newington quickly reestablished itself on the defensive end to make sure the defending champs would never get so close again. The Indians finished with a total of 10 takeaways in the first half to help push its lead back to nine. A running floater off the glass by RHAM’s Jaclyn Santella at the halftime buzzer trimmed it to seven at the break to end a first half otherwise dominated by Newington. Zocco maintained her hot streak from beyond the arc in the second half, knocking down her fourth triple of the night to give Newington a 16-point lead late in the third quarter, its largest lead of the night. Zocco and Frazier’s offense sparked a 19-point third quarter to extinguish any chance of a RHAM comeback, as the Indians secured one of their strongest wins of the year amidst a season that has had plenty of victories to choose from. Newington: Sabrina Soler 1-2-4, Alexis Harris 0-0-0, Ashanti Frazier 9-0-18, Abygale Flores 3-0-9, Olivia St. Remy 1-3-5, Maya Gajowiak 0-0-0, Alexie Armour 1-0-2, Karissa Zocco 1-4-17. Totals: 16-9-55. RHAM: Samantha Freeman 2-0-7, Jaclyn Santella 4-3-14, Marisa Lee 6-1-13, Harleigh Roach 1-0-2, Julia Hancin 4-2-10, Megan Lukowski 0-0-0, Marissa Colonna 0-0-0. Totals: 17-6-46. Posted in Newington Town Crier, Newington on Tuesday, 22 January 2019 21:31. Updated: Tuesday, 22 January 2019 21:34.